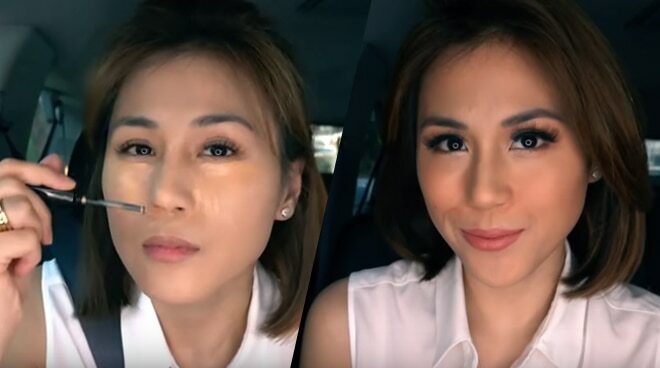 Toni Gonzaga achieved her glowing makeup look while on her way to the Big Brother house from her home. Juggling motherhood and her career as a celebrity, Toni Gonzaga admits she barely gets enough sleep. And while she is naturally beautiful, she needs to make sure she looks good on screen - especially when she has a show watched by millions of Filipinos daily. While it’s no secret that Toni Gonzaga does her own makeup most of the time, fans have not seen her yet do it inside a car - a pretty wise move to utilize her time on the road while dealing with the traffic around the Metro. That’s exactly what she did in her new vlog entry while on her way to the Big Brother house from her home. Going for a more natural look as per instruction of Direk Laurenti Dyogi, the Pinoy Big Brother mainstay started off her makeup video with a primer which she says is a way to cover spots, bumps, and uneven skin tone - allowing her to have a “smooth canvas” before she puts on the rest of her makeup. Then, she followed it up with a concealer, eye shadow, and her eyebrows. Then, she started putting on some contour, eyeliner, and some fake eyelashes which she reveals make a huge difference especially for chinita girls like her. Having started her vlogging journey last January, Toni Gonzaga has already amassed more than 760,000 subscribers on her YouTube channel.